"Simplify your campaign management, maximise your conversion value and expand your reach"
They simply require you to provide your campaign objectives and budget. From there, Google will carry out automated bidding and ad placements on your behalf. If you are an online retailer with a more limited budget and time constraints, Smart Shopping campaigns could be the perfect fit for you. Audience targeting, device targeting, multiple campaigns, bid adjustments, placements, remarketing ads and shopping ads. Smart Shopping campaigns have an expanded reach, optimized across all Google networks. 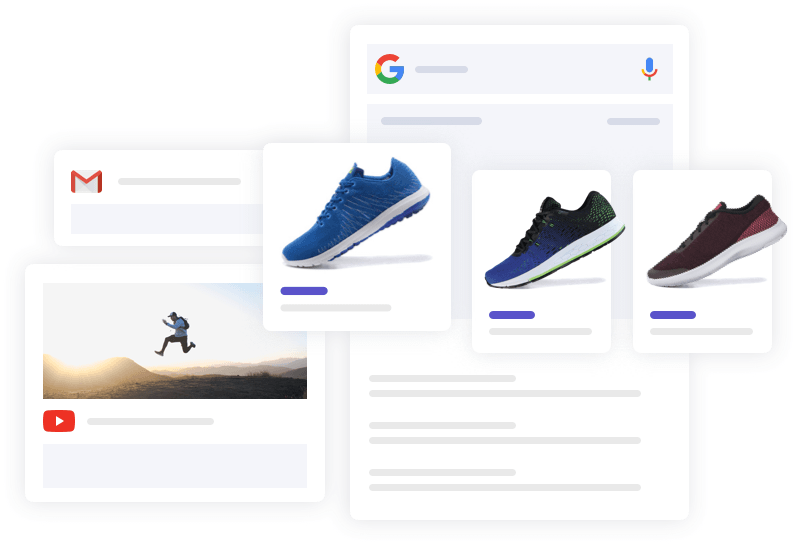 Your shopping ads will be one feed and campaign across all networks, serving users not only on the search and shopping networks but on the display network, YouTube and Gmail too. Google chooses when and where to show your ads through a fully-automated process, based on the likelihood of your ads converting into sales. This expanded reach maximises your chances of getting ads in front of potential customers. In theory, machine learning and automation will show the right products, to the right people, in the right place and time. In Europe, Smart Shopping Campaigns can be used with any Comparison Shopping Service (CSS) you work with. Your ads with show on search results pages and any other services which your CSS has opted into. Other automated bidding strategies focus on generating conversions, but Smart shopping focuses instead on generating revenue instead by maximising the conversion value. The strategy tries to generate as much revenue as possible out of a given budget. When using Smart Shopping Campaigns, you can also use a second bidding strategy: Target ROAS. This is still focused on conversion value, but gives the user more control over the spend with a stricter ROI goal. Think strategically before commit to a particular bidding strategy. It might not seem a big deal, but can have a significant impact on your campaign performance. Maximize conversion value will seek to maximize your ROI within a given budget, while target ROAS sticks to the target you set. Automation of your entire shopping campaign is an obvious time-saver, but there will of course be concequences of this loss of granular control. Location targeting is not available – you can set the country of sale, but you can’t target specific regions or exclude specific cities in your advertising. Negative keywords are not available. So you have less control over the context in which your ads will automatically appear. In fact, there is obviously going to be much less control in general over when & where your ads appear when running a Smart Shopping Campaign. Unable to report on performance from the different networks separately. Due to the fact that Smart Shopping combines standard Google shopping ads with display re-marketing makes it impossible to attribute positive or negative results to one channel or the other. We've looked at what Smart Shopping campaigns are, some of the strengths and some of the weaknesses. If you do choose to implement a Smart Shopping campaign, we've pulled out some best practices to get you started on the right lines. 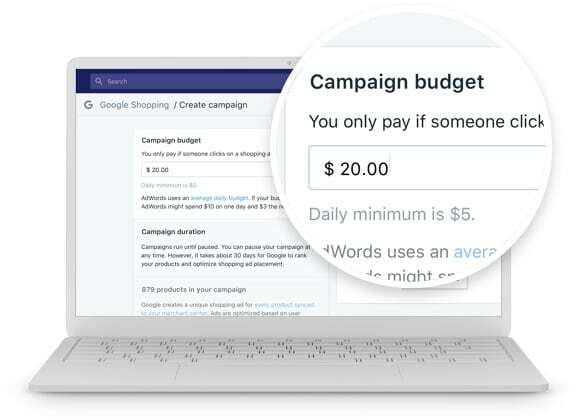 When setting the budget for your new Smart Shopping campaign, Google recommends that you use the combined historical daily spend of your current standard Shopping and display re marketing campaigns to set your budget. Add as many products as are applicable to your campaign. It is recommended by Google that the selection of products for your new campaign is comparable to campaigns you've run in the past. Remember that dynamic re-marketing ads often show multiple products form the same campaign, so the more products there are in your campaign, the better the performance will be. It should go without saying that you use a high-quality logo and image assets that showcase your business in a good light. Just as you would with a standard Shopping campaign, optimize the titles, descriptions, and images in your feed for relevance, and operate within Google’s spec requirements. Check up on your performance after a minimum of 15 days. If it looks good you can add other product groups until you eventually add your entire catalog. Consider doing this even within the same campaign and even when you are targeting the whole catalog. This way you can get granular reports and will be able to gauge campaign performance based on how product groups are doing. Being able to use automated bidding, expansive reach, hands-off Conversion Rate Optimization are all attractive prospects for digital advertisers. Using Smart Shopping won't bring guaranteed results, but it certainly does mean less time managing your account and chances to A/B test campaign performance. With that being said, the only real way to know if Smart Shopping campaigns are a good fit for your advertising strategy is to test. Trial-and-error has always been essential for every Google Ads account manager. Reach out to us if you have questions about Smart Shopping Campaigns or want to find out more.